This is a really exciting month for me. Not only does March complete a full year of bullet journaling for me, both my one year calligraphy and blog anniversaries are this month! 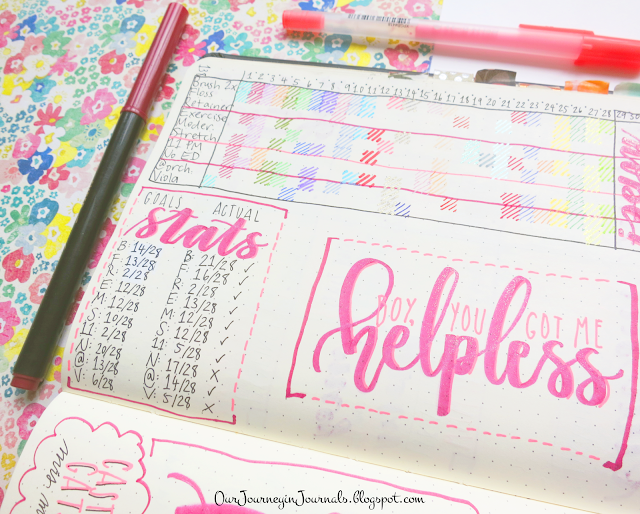 It only hit me yesterday that I've almost been using the bujo system for an entire year, and it's kind of crazy to see how it's both changed and stayed the same from when I first started back in April of 2016. 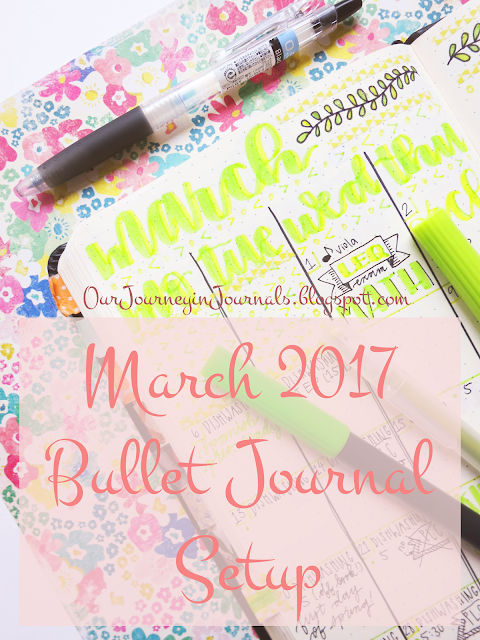 Anyway, if you want to see my March 2017 bullet journal setup and compare it to April (link above), then keep reading! First, here is February's completed monthly spread. Nothing much to say about it, but I really do like how it looks. 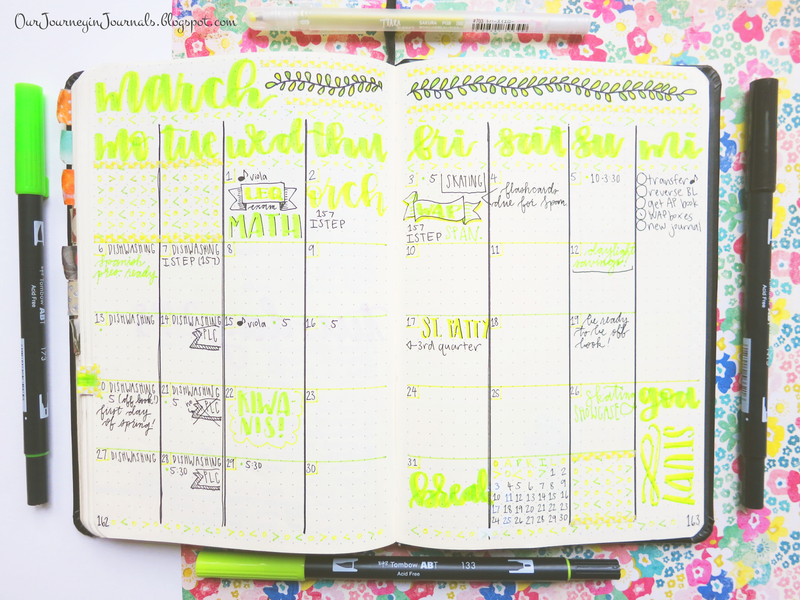 This is one of my favorite patterns of washi tape that I own, and it matches very well to the rest of the spread in my opinion. 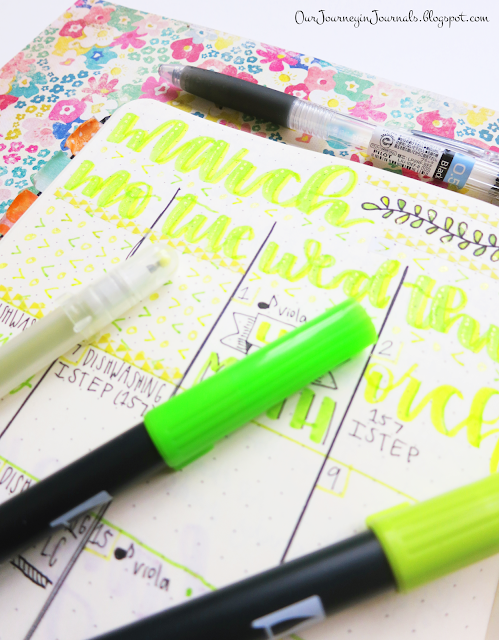 Here is March's bullet journal monthly spread! I used Tombow Dual Brush Pens for the lettering. It's not actually this fluorescent in real life, but this picture is not very color accurate. The main green is like the cap of the marker on the left (133 chartreuse), and the "shading" color is more of a lime green, like the cap of the marker on the bottom (173 willow green). The washi tape is about the same color as the lime green marker, but it's slightly yellower. I also used a glittery yellow Sakura Gelly Roll Stardust gel pen to add some details on top of letters, but you can't see it well in this picture. Also, doesn't this color scheme remind you of lemonade/limeade? The vine things at the top were inspired by Boho Berry's March setup, and the black part is made with the black Tombow Dual Brush Pen; the leaves are colored with the two same green markers I used for the rest of the spread. I think they look really cute! For the vines on this monthly spread, I also added a couple dots of the Sakura Gelly Roll Stardust here and there on the leaves. If you have read my past monthly bullet journal setup posts, then you know that I use a specific pattern of washi tape as decoration on the spreads themselves and also as a tape flag. However, the tape I used for March is a skinny one, so it's not wide enough to work well as a bookmark. So, I cut out a small rectangle of paper, colored it using the same Tombows as before, put tape on the borders of the paper flag, and then taped it onto the appropriate pages. This is my bullet journal habit tracker layout from February. I was really good with my goals (especially compared to in January), which I am really proud of! At the end of the month, I counted up how many days I did each habit and then used my stats from February to set my goals for March. The left side, as you can see, is the habit tracker spread. 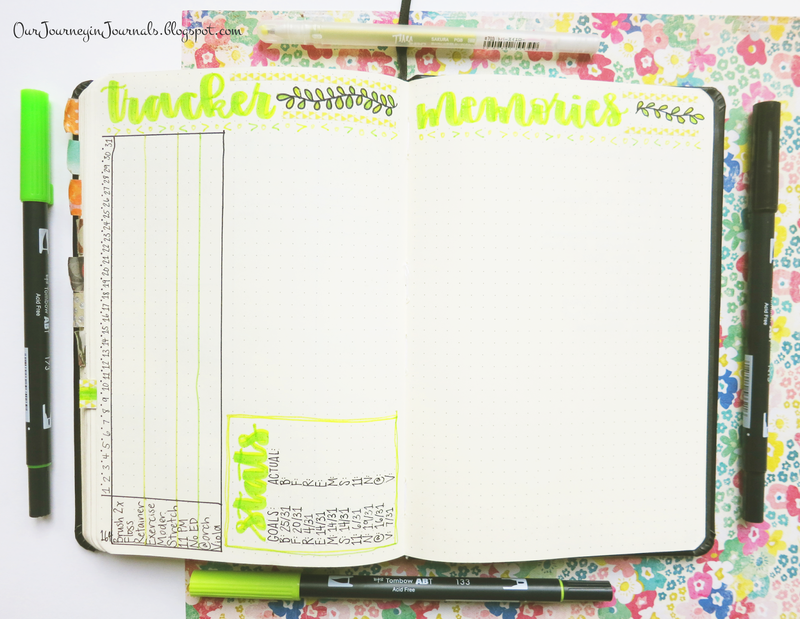 My goals for the month are in the bottom right corner of the page, and my blank memory spread is on the right. This is my monthly memories spread from February. I am not a big fan of how this looks, and making this made me realize that February was mostly a pretty boring month. 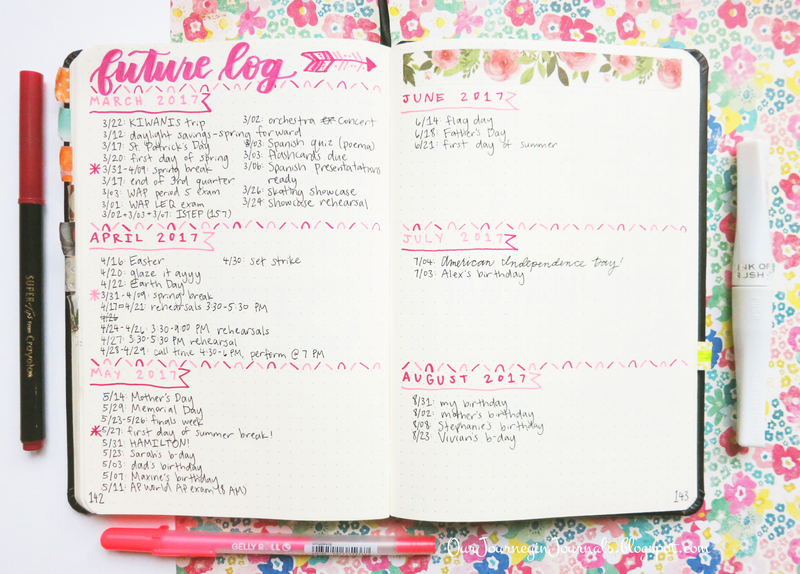 This is my future log for March to August. I had to make a new one since February was my 7th month in this notebook (meaning the old one only covered September to February). So that is it with my March 2017 bullet journal setup! 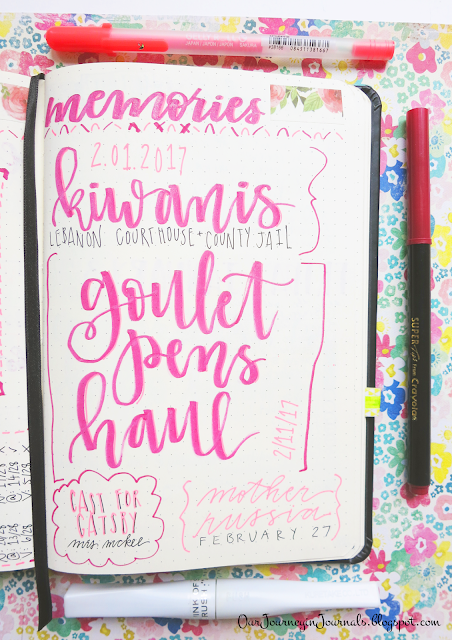 Sometimes, I think, "Wow, I spend an ungodly amount of time on making my bujo pretty!" 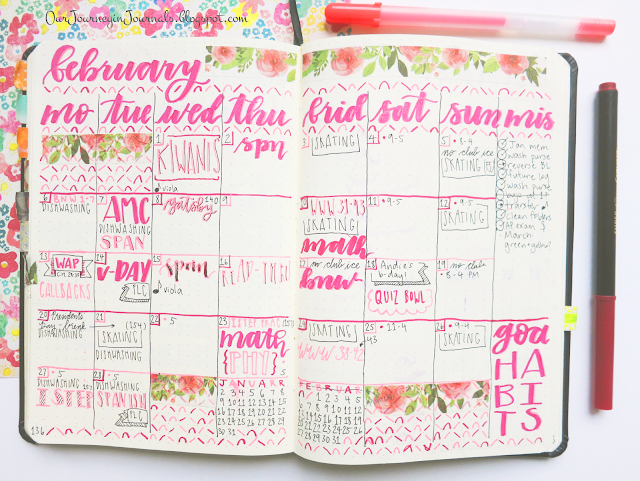 but then I realize how happy it makes me just looking at all the calligraphy and the coordinating colors. It certainly has gotten much prettier compared from my first monthly spread. How long have you been bullet journaling? Let me know in a comment down below!